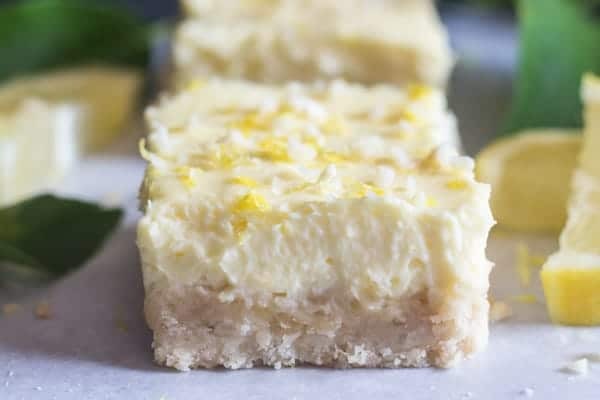 These Lemon Cheesecake Squares are so delicious, made with a shortbread base and topped with a creamy Lemony filling. The Perfect dessert Cookie Bar. 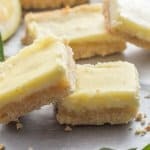 Lemon Cheesecake Squares were always a Christmas tradition in my home in Canada. Have I ever said I love cheesecake? Well I do! 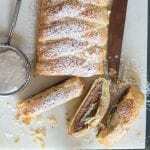 And these I must say are the easiest and tastiest ones out there, from the almond shortbread crust to the creamy lemon filling. They are perfect. I told her I thought I would freeze them for Christmas, but we both know a freezer isn’t going to stop us from eating these! Lemon Cheesecake Base before baking. 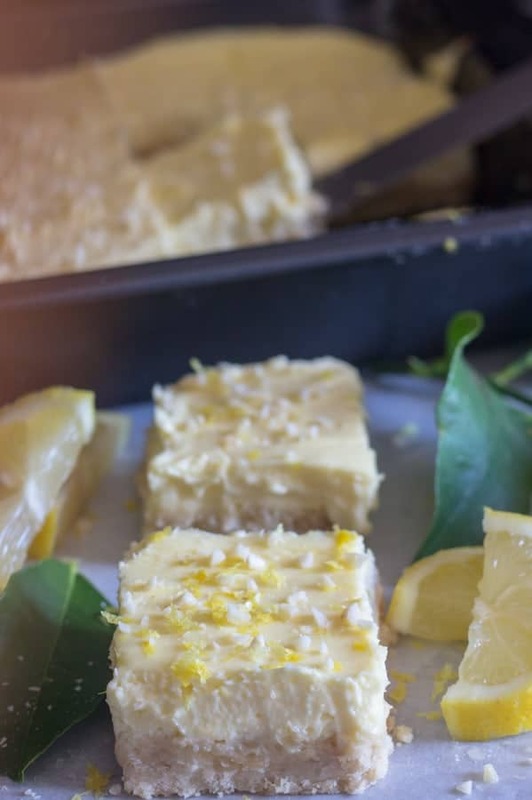 Lemon Cheesecake Bars ready for baking. stir in the melted butter and combine just until mixture is crumbly. Place the mixture in an 8″ square cake pan and press down firmly. Bake for 15 minutes. In a medium bowl beat the cream cheese, sugar, egg, juice and zest at medium speed until smooth and creamy. Spread evenly over baked crust. Bake for approximately 12-15 minutes or until set. Let cool. Refrigerate a couple of hours before cutting. Make sure to use regular Cream Cheese and not light, it makes a smoother and creamier cheesecake. Which is exactly what we want. With the Holidays and Christmas approaching, and of course the start of the baking season it is a good thing I have a big freezer, looks like a lot of cookies and bars will be joining the lemon cheesecake squares. My Italian friends and family always look forward to a gift box at Christmas filled with all their favourite Cookies and Bars. 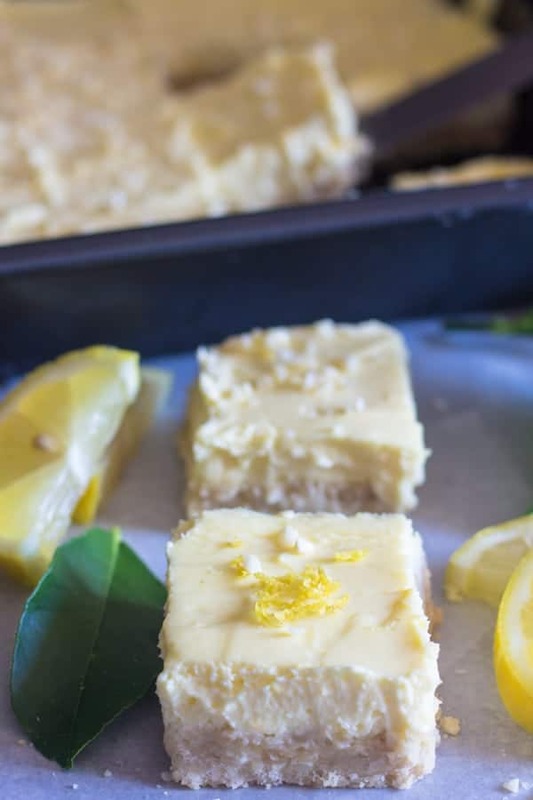 What I like so much about these lemon cheesecake squares besides being so darned delicious, is the light taste of almonds in the shortbread base, and that amazing creamy lemon filling, the combination is perfect. Believe me it was really tough pulling myself away from them. If you like you could serve a larger piece as a dessert or cut them into smaller squares and serve them with other Christmas Cookie favourites, these would also make a perfect Easy Summer Dessert Recipe. A delicious almond shortbread base & a creamy lemony filling. The perfect Cookie Bar or Dessert recipe. Pre heat oven to 350 degrees (180 degrees celsius). 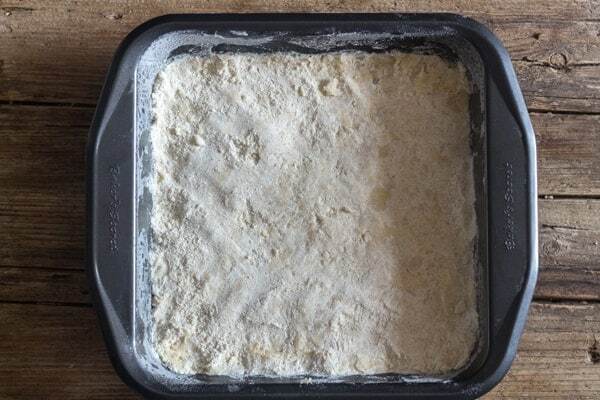 Lightly grease and flour a 9 inch (23 cm) square cake pan. In a small bowl with a fork combine flour, sugar and almonds, add butter (melted) and combine just until mixture is crumbly. 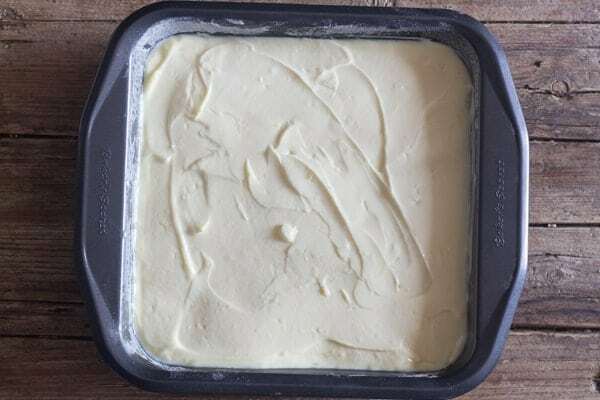 Place mixture in the prepared square cake pan and press down firmly. Bake for 15 minutes. 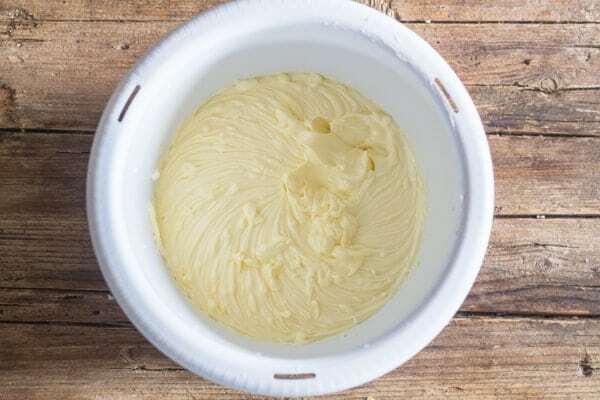 While the base is baking make the filling, in a medium bowl beat at medium speed the cream cheese, sugar, eggs, lemon juice and zest together until smooth and creamy, approximately 2 minutes. Spread evenly over baked crust (cool 5 minutes). Bake for approximately 12-15 minutes or until set. Let cool. Refrigerate about 2 hours before cutting. Enjoy! So my cream cheese mixture cane out very runny and after baking for 15 mins I put in fridge. Hopefully it comes out!! Also used pecans instead of almonds!! Hi Haley, that’s strange did it turn out ok? Hi Sandi, I don’t know how that will taste, let me know. I just wondered if you could swap out crushed pretzels for the almond. Just to give a slightly salty crust. My family is not big into nuts. Hi Cheryl, that would probably work, sounds interesting. Let me know how it goes. 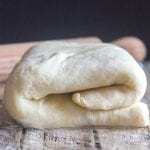 Can I substitute pie crust for the shirt bread? Hi Lana, I suppose you could, but then it wouldn’t be the same, it would become a pie rather than cookie bars. If you do, let me know how it goes. These were a great hit in our family! We shared some with our neighbours and they also found them so delicious. 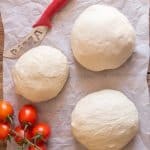 Thank you for sharing the recipes! Hi Maria, thanks so glad you enjoyed them, yes one of my favourites too! Have a great week. I made these and they are AWESOME — I did tweak the recipe a little bit — For the crust I used almond flour instead of crushed almonds & I added 1/2 c. (or so) graham cracker crumbs. I also added a layer of raspberry filling between the crust and the lemon cheesecake mixture. O.M.G – Delicious! Hi Andrea, so glad you liked them and great idea. Happy New Year. Enjoy your site. I made these They are delicious. Any thoughts about doubling the cheesecake filling. Simply double the ingredients? Hi Ellen, thanks so much and yes no problem just double the ingredients. Hi Rosemary I made these over the holiday weekend and they are so delicious. Thanks again for a great recipe. Hi Alison, so glad you enjoyed them. You mentioned freezing these, do you bake them all the way then freeze? Or do you freeze before baking? And what about thawing them out to serve? Hi Kayla, I actually have some in the freezer now. I bake them and let them cool and then freeze (cover completely). And just let them either thaw in the fridge or room temperature. I have a pretty cool house, but it your house is hot I would thaw in the fridge. Hope that helps. I am officially drooling. 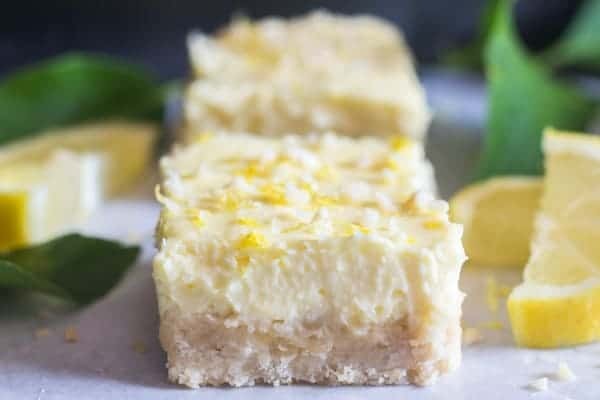 I love lemon desserts and these are calling my name!! Delicious. Hi Olivia, thanks can’t get much better than a Lemon Dessert. Have a great weekend. The almond shortbread sounds like a great compliment to the lemon cheesecake. Hmm, I might just have all of the ingredients on hand to make these right now. 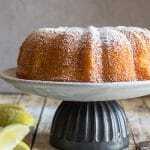 Hi Audrey, thanks, it is really a good recipe and one of our favourites. HI Katherine, thank you and all those cookies look so delicious! These look absolutely sinful and must admit being Italian myself love Italian cheesecake so very much. So, cannot thank you enough for linking these up with us today at the Christmas Cookie Swap and have totally pinned to try!! Hi Janine, thanks, I love cheesecake too and these are so easy and good. Hope you enjoy them.